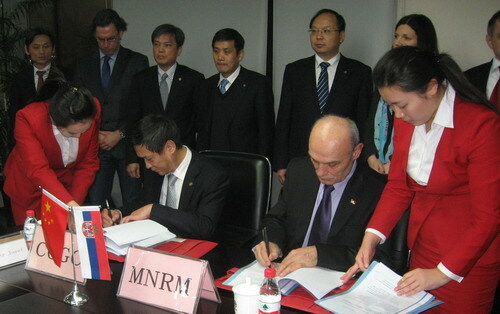 (Beijing, 28 January 2013) Minister of Natural Resources, Mining and Spatial Planning of the Republic of Serbia, Prof. dr Milan Bačević visited People's Republic of China 24-27 January 2013. During the visit, Minister Bačević met with officials and representatives of Chinese companies and signed a Protocol of Understanding for the development of a feasibility study of the construction of the waterway "Morava Channel." This project would be of great importance for Serbia, but it would also be very useful for the countries of Central and Western Europe, since the channel "Morava" would be associated with the largest waterway systems in Europe: the Rhine-Main-Danube, Odra-Visla and Seine-Rhone. During his visit to China, Minister Bačević visited the Chinese city Jichang, where the largest dam in the world "Three Gorges" is built.